The volt (symbol: V) is the derived unit for electric potential, electric potential difference (voltage), and electromotive force. The volt is named in honour of the Italian physicist Alessandro Volta (1745–1827), who invented the voltaic pile, possibly the first chemical battery. 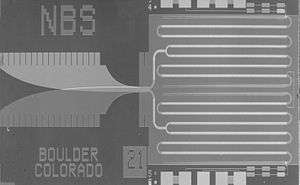 This standard is typically realized using a series-connected array of several thousand or tens of thousands of junctions, excited by microwave signals between 10 and 80 GHz (depending on the array design). Empirically, several experiments have shown that the method is independent of device design, material, measurement setup, etc., and no correction terms are required in a practical implementation. In the water-flow analogy sometimes used to explain electric circuits by comparing them with water-filled pipes, voltage (difference in electric potential) is likened to difference in water pressure. The relationship between voltage and current is defined (in ohmic devices like resistors) by Ohm's Law. Ohm's Law is analogous to the Hagen–Poiseuille equation, as both are linear models relating flux and potential in their respective systems. 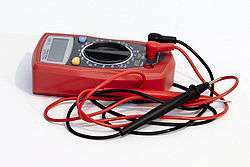 A multimeter can be used to measure the voltage between two positions. The voltage produced by each electrochemical cell in a battery is determined by the chemistry of that cell. Cells can be combined in series for multiples of that voltage, or additional circuitry added to adjust the voltage to a different level. Mechanical generators can usually be constructed to any voltage in a range of feasibility. Internal Combustion Automobile electrical system: nominal 12 V, about 11.8 V discharged, 12.8 V charged, and 13.8–14.4 V while charging (vehicle running). High-speed train overhead power lines: 25 kV at 50 Hz, but see the list of current systems for electric rail traction and 25 kV at 60 Hz for exceptions. Lightning: Varies greatly, often around 100 MV. 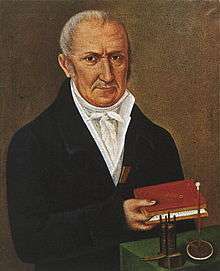 In 1800, as the result of a professional disagreement over the galvanic response advocated by Luigi Galvani, Alessandro Volta developed the so-called voltaic pile, a forerunner of the battery, which produced a steady electric current. Volta had determined that the most effective pair of dissimilar metals to produce electricity was zinc and silver. In 1861, Latimer Clark and Sir Charles Bright coined the name "volt" for the unit of resistance. By 1873, the British Association for the Advancement of Science had defined the volt, ohm, and farad. In 1881, the International Electrical Congress, now the International Electrotechnical Commission (IEC), approved the volt as the unit for electromotive force. They made the volt equal to 108 cgs units of voltage, the cgs system at the time being the customary system of units in science. They chose such a ratio because the cgs unit of voltage is inconveniently small and one volt in this definition is approximately the emf of a Daniell cell, the standard source of voltage in the telegraph systems of the day. At that time, the volt was defined as the potential difference [i.e., what is nowadays called the "voltage (difference)"] across a conductor when a current of one ampere dissipates one watt of power. Group photograph of Herman Helmholtz, his wife (seated) and academic friends Hugo Kronecker (left), Thomas Corwin Mendenhall (right), Henry Villard (center) during the International Electrical Congress. The international volt was defined in 1893 as 1/1.434 of the emf of a Clark cell. This definition was abandoned in 1908 in favor of a definition based on the international ohm and international ampere until the entire set of "reproducible units" was abandoned in 1948. Prior to the development of the Josephson junction voltage standard, the volt was maintained in national laboratories using specially constructed batteries called standard cells. The United States used a design called the Weston cell from 1905 to 1972. This SI unit is named after Alessandro Volta. As with every International System of Units (SI) unit named for a person, the first letter of its symbol is upper case (V). 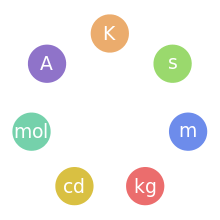 However, when an SI unit is spelled out in English, it should always begin with a lower case letter (volt)—except in a situation where any word in that position would be capitalized, such as at the beginning of a sentence or in material using title case. Note that "degree Celsius" conforms to this rule because the "d" is lowercase.— Based on The International System of Units, section 5.2. ↑ "SI Brochure, Table 3 (Section 2.2.2)". BIPM. 2006. Retrieved 2007-07-29. ↑ Keller, Mark W (2008-01-18), "Current status of the quantum metrology triangle" (PDF), Metrologia, 45 (1): 102–109, Bibcode:2008Metro..45..102K, doi:10.1088/0026-1394/45/1/014, ISSN 0026-1394, Theoretically, there are no current predictions for any correction terms. Empirically, several experiments have shown that KJ and RK are independent of device design, material, measurement setup, etc. This demonstration of universality is consistent with the exactness of the relations, but does not prove it outright. ↑ Hill, Paul Horowitz; Winfield; Winfield, Hill (2015). The Art of Electronics (3. ed.). Cambridge [u.a. ]: Cambridge Univ. Press. p. 689. ISBN 978-0-521-809269. Latimer Clark and Sir Charles Bright (1861) "On the formation of standards of electrical quantity and resistance," Report of the Thirty-first Meeting of the British Association for the Advancement of Science (Manchester, England: September 1861), section: Mathematics and Physics, pp. 37-38. Latimer Clark and Sir Charles Bright (November 9, 1861) "Measurement of electrical quantities and resistance," The Electrician, 1 (1) : 3–4. ↑ Sir W. Thomson, et al. (1873) "First report of the Committee for the Selection and Nomenclature of Dynamical and Electrical Units," Report of the 43rd Meeting of the British Association for the Advancement of Science (Bradford, September 1873), pp. 222-225. From p. 223: "The "ohm," as represented by the original standard coil, is approximately 109 C.G.S. units of resistance ; the "volt" is approximately 108 C.G.S. units of electromotive force ; and the "farad" is approximately 1/109 of the C.G.S. unit of capacity." ↑ (Anon.) (September 24, 1881) "The Electrical Congress," The Electrician, 7 : 297. ↑ Hamer, Walter J. (January 15, 1965). Standard Cells: Their Construction, Maintenance, and Characteristics (PDF). National Bureau of Standards Monograph #84. US National Bureau of Standards. Look up volt in Wiktionary, the free dictionary.